Stephen Christopher Spagnuolo (/spæɡˈnɔːloʊ/, Italian pronunciation: [spaɲˈɲwɔːlo]; born December 21, 1959) is an American football coach who is the defensive coordinator of the New York Giants of the National Football League (NFL). Spagnuolo was hired by the Giants after two seasons as a defensive assistant with the Baltimore Ravens, and was first hired by the Giants in 2007 after spending eight years on the defensive staff of Jim Johnson of the Philadelphia Eagles. 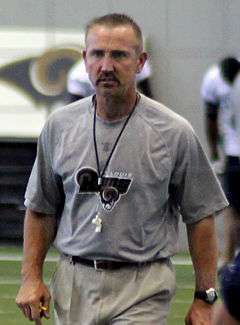 Spagnuolo was hired by the St. Louis Rams in 2009 to be their head coach, but was fired after three seasons. He became the defensive coordinator for the New Orleans Saints in 2012 but was fired after only one year. Spagnuolo has also worked as a college football assistant coach for the University of Connecticut, the University of Maine, Lafayette College, Rutgers University, Bowling Green University, and the University of Massachusetts-Amherst. He also spent time in the original World League of American Football and its successor, NFL Europe. Born in the Whitinsville section of Northbridge, Massachusetts, Spagnuolo moved to Grafton as a youth. After graduating from Grafton (MA) High School, Spagnuolo played wide receiver at Springfield College. He assisted the University of Massachusetts football team while pursuing his graduate degree. Spagnuolo began his NFL coaching career in the Philadelphia Eagles organization in 1999, serving as linebackers and defensive backs coach. He remained there for eight years. In January 2007, he was hired as the defensive coordinator for the New York Giants, under Head Coach Tom Coughlin. He spent two years in New York, and was the architect of the aggressive defensive strategy against the New England Patriots (the highest scoring offensive team in NFL history) in Super Bowl XLII, which was instrumental in the close victory by the Giants. Following the Super Bowl win and a great deal of praise, Spagnuolo's name was widely circulated for open head coach positions around the NFL. On February 7, 2008, he took his name out of consideration for the head coaching position of the Washington Redskins. The same day, the New York Giants made Spagnuolo one of the highest-paid defensive coordinators in the NFL with a new three-year contract, worth roughly $2 million a year. Following another successful season in 2008, In which the Giants finished the season 12-4 but lost in the Divisional round of the NFL Playoffs, Spagnuolo's name came up as a replacement for numerous head coaching vacancies once again, including those for the Denver Broncos, New York Jets, and Detroit Lions, but Spagnuolo decided to join with the St. Louis Rams, taking over their head coaching vacancy with a 4-year, $11.5 million contract. Spagnuolo hired Pat Shurmur and Ken Flajole to be the Rams' offensive and defensive coordinators respectively. Spagnuolo then hired Josh McDaniels to be the team's offensive coordinator to replace Shurmur, who left for the Browns' head coaching job. Spagnuolo's first season saw the Rams go 1-15, the worst record in the league and the worst season in franchise history. After rebounding to 7-9 in 2010, they regressed to 2-14 in 2011, tied with the Indianapolis Colts with the worst record in the league. He was fired on January 2, 2012 after compiling a 10-38 overall record in his three seasons in St. Louis, the second-lowest winning percentage for a non-interim coach in franchise history. On January 19, 2012, Spagnuolo agreed to terms with the New Orleans Saints to become the new defensive coordinator under head coach Sean Payton, choosing this position rather than an offer from the Philadelphia Eagles. However, Payton was subsequently suspended for the season for his alleged role in the New Orleans Saints bounty scandal, leaving Spagnuolo to coach the defense without Payton's input. In 2012, the Saints allowed the most yards for a season of any defense in NFL history en route to finishing 7-9 and missing the playoffs for the first time in four years. Soon after Payton's suspension ended, Spagnuolo was fired on January 24, 2013. Baltimore hired Spagnuolo as a senior defensive assistant before the 2013 season, then promoted him to assistant head coach/secondary coach in 2014. On January 15, 2015, Spagnuolo rejoined the New York Giants as defensive coordinator. The Giants finished last in the NFL for defense his first year back. Also, after interviewing to become the Head Coach of the New York Giants (the job was given to Ben McAdoo) it was reported by Ian Rapaport on January 13 that Spagnuolo will remain the team's Defensive Coordinator for the upcoming 2016 NFL season. Spagnuolo learned under Philadelphia coach Jim Johnson, and shares the same aggressive, blitz-heavy approach as his mentor. (He did not incorporate this philosophy during his time in New Orleans however) and Spagnuolo uses a 4–3 base defense with a heavy emphasis on multiple blitz packages, including corner and safety blitzes. While defensive coordinator of the New York Giants, he often used a smaller defensive line, with three or even four defensive ends to further pressure the quarterback. This philosophy proved successful, with the Giants leading the NFL in sacks in 2007. During Super Bowl XLII, Spagnuolo's defense sacked Tom Brady five times, the most times he had been sacked in any game that season. ↑ Powers, John (February 3, 2008). "Spagnuolo has brought Giants' defense a long way". Boston Globe. ↑ Branch, John (February 8, 2008). "Spagnuolo's Decision to Stay With Giants Is Rewarded". New York Times. ↑ "St. Louis Rams pick Steve Spagnuolo as coach". ESPN. January 17, 2009. ↑ Thomas, Jim (January 2, 2012). "Rams fire Spagnuolo, Devaney". St. Louis Post-Dispatch. Retrieved 2012-01-20. ↑ "Rams, Bucs ax coaches; Colts ax VP, GM". Fox Sports. January 3, 2012. Retrieved 2012-01-20. ↑ Peter King, "Spotlight", Sports Illustrated, September 3, 2012. ↑ Yasinskas, Pat (19 January 2012). "Sources: Steve Spagnuolo to join Saints". ESPN. Retrieved 19 January 2012. ↑ Rosenthal, Gregg (24 January 2013). "Steve Spagnuolo, Ken Flajole released by New Orleans Saints". National Football League. Retrieved 24 January 2013. ↑ Steve Spagnuolo at Baltimore Ravens official website (accessed 2014-01-15). ↑ "Giants hire Steve Spagnuolo as defensive coordinator". NBC Sports. Retrieved 15 January 2015. ↑ "Steve Spagnuolo". Pro Football Reference.com. 2009. Retrieved 2010-10-19.